From 236.com. Click for LARGE. Strike Over. Contract Vote in Progress. Writers went back to work Wednesday. Contract vote is next week. It will be approved. Writing can resume immediately. If you were employed when the strike began, you should plan to report to work on Wednesday. If you're not employed at an office or other work site, call or e-mail your employer that you are resuming work. If you have been told not to report to work or resume your services, we recommend that you still notify your employer in writing of your availability to do so. Questions concerning return-to-work issues should be directed to the WGAW legal department at 323.782.4521 or the WGAE’s assistant executive director Ann Toback at 212-767-7823. The decision to begin this strike was not taken lightly and was only made after no other reasonable alternative was possible. We are profoundly aware of the economic loss these fourteen weeks have created not only for our members but so many other colleagues who work in the television and motion picture industries. Nonetheless, with the establishment of the WGA jurisdiction over new media and residual formulas based on distributor’s gross revenue (among other gains) we are confident that the results are a significant achievement not only for ourselves but the entire creative community, now and in the future. We hope to build upon the extraordinary energy, ingenuity, and solidarity that were generated by your hard work during the strike. Over the next weeks and months, we will be in touch with you to discuss and develop ways we can use our unprecedented unity to make our two guilds stronger and more effective than ever. Now that the strike has ended, there remains the vote to ratify the new contract. Ballots and information on the new deal, both pro and con, will be mailed to you shortly. You will be able to return those ballots via mail or at a membership meeting to be held Monday, February 25th, 2008, at times and locations to be determined. Thank you for making it possible. As ever, we are all in this together. 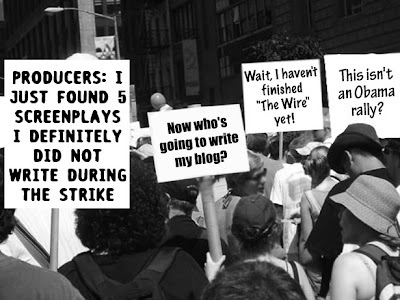 The writers lost the 1988 strike. Badly. The strike lasted five months. Eventually with the union splintering, writers going financial core, everyone turning on each other and the studios laughing, the writers gave up. After having shut down production for five full months, the WGA took the same deal offered at month three. With a smidge of change for saving face and not much of a smidge. Joan Didion wrote an essay about the 1988 strike for The New Yorker. Explains Los Angeles, the politics, and writers staying out that extra hopeless two months. 'Cause even though this time was about new media -- and it was -- the failure of 1988 was never far from anyone's mind. Meet the old boss, same as the new boss... Los Angeles Days.